Since planet Saturn's orbit is between 28 and 30 years' duration, a Saturn Return horoscope is 'good for' about three decades. 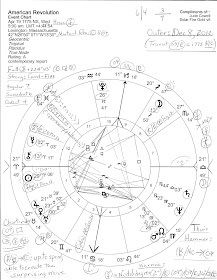 The last and current Saturn Return of Donald Trump (#3 of 3 conjunctions) perfected on May 24, 2005 and the chart below details the experiences, conditions, and influences that we're all suffering through now as his leadership, authority, and authenticity are challenged by Saturnian figures of governmental, legal, and other fact-finding realms. For as you know, astrological Saturn prefers just the facts and when returning to natal degree, he demands accountability, maturity, and the correction of past mistakes. Therefore, based on his recent and current behavior, we immediately see that Mr. Trump has major problems complying with the commands and imperatives of Saturn because taking responsibility and owning up to his own guilt and irresponsible actions are arrows not found in his quiver. We might even say he resists such mature behavior and has famously asserted that he's never made a mistake! See "I Don't Talk That Way." Except When He Does about Trump's foolish denial of hurling certain insults at AG Jeff Sessions. For a complete study of Trump's Saturn condition, several horoscopes should be considered including his natal chart and natal Saturn's aspects, progressions, and his very first Saturn Return (age 29, July 25, 1775 with Saturn in Return 9th house along with Mercury @24:34 and Sun @2Leo10; Saturn is squared by Jupiter in Aries and by Uranus in Libra which forms a T-Square: Jupiter-Uranus = Saturn with potentials for one-sided principles (wait! he has principles? ), obstinacy, sudden disadvantages or losses. These horoscopes are helpful guides to his/our present circumstances particularly in the realms of authority, plus, other planetary return charts and transits add details to the cosmic picture and although I've studied them, this is a post not a book so no charts will be published here other than Trump's third of three Saturn Returns, the horoscope in effect since he ran and 'won' the White House--and at this moment. General notes on Saturn Returns will follow, below. The Mercury-Saturn sextile indicates getting into wearisome quarrels, holding on to petty grievances, and nagging that destroys harmony in relationships. An inability to listen to others is also suggested as well as neglect of basic rules and a lack of respect for others' need for personal space. However, it does show a potential for good management and a concern (overconcern?) for details (Epstein). Saturn is also engaged with quirky Uranus via a sesquis-square (135 degrees), a dynamic 'square within a square' denoting complex or complicated conditions which may hint at Melania's immigrant status and relationship/freedom issues around that time. 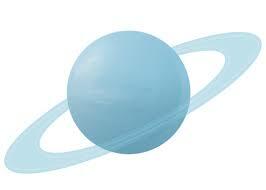 Of course, Saturn is the planet of tradition and The Past while Uranus prefers progress and The Future. 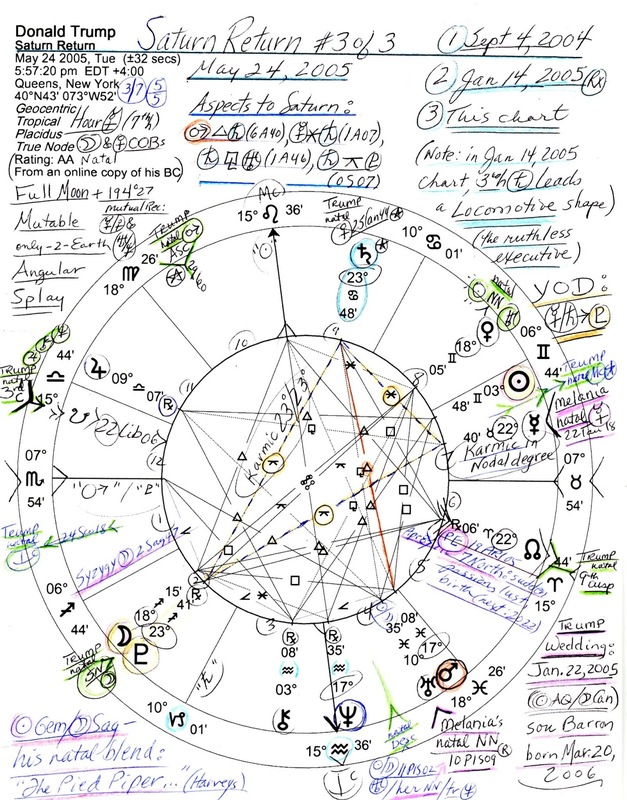 And according to Robert Pelletier, Trump's Saturn-Pluto inconjunct (150 degrees) shows tendencies toward: voicing complaints about unfair competition (plus, his natal Jupiter in Libra: "it's not fair! "), laboring and wasting time over trifles, questioning valid candidacies (ex: Obama), and being impressed with his own sense of responsibility which compels him to take on more than he can handle. And here we are. In general, a Saturn Return identifies the phase in which we enter a new cycle of experience and a new set of environmental conditions with which we can work. The Return house of Saturn denotes the area in which we are ambitious and/or seek recognition. Here in the 9th house, Mr. Trump seeks approval and recognition for his intellectual capacities yet his Geminian traits keep him on lighter levels of superficial understanding, quixotic notions, and an obsession over minor details as he often misses the wider points or the bigger picture in situations, events, and experiences. Plus, he seems unaware or simply unappreciative of the ultimate consequences of his actions, many of which are dire for other people whose feelings he twists for his own purposes but never genuinely considers. Trump's urge for professional development is strong with his natal Saturn in business-savvy Cancer, yet we find that his personal compulsion toward self-protection (Cancer, the Crab in his shell) is operative in political realms via protectionism (exs: trade tariffs, removal of US from treaties and alliances as per Putin, his 'lodestar' of authority; 'wall building'), plus, his 'ivory tower' isolation (cheeseburgers in bed, no uncomfortable State Dinners), extreme emotional sensitivity, and difficult family ties which cause disadvantages whether he admits it or not. Such is karmic Saturn in Moon-ruled Cancer where the planet of maturity, authority, and accountability is in his detriment so acting maturely is difficult for him as is the expression of true emotions and sentiments. There's ambition and strategy in abundance, yes, but a tendency toward depression is also suggested by this placement in which feelings of emotional isolation can lead to neurotic, self-defeating behavior. In addition there is a leaning toward financial difficulties which have certainly been the case and seem to lie at the root of his foreign involvement as a businessman. And as you know, Saturn in Cancer people are talented in the field of Real Estate but Trump's underworld ties probably began there with Saturnian concrete which had to be purchased from mobsters! So when playing the POTUS role, Saturnian weaknesses become particularly problematic and in fact, can place a wheeler dealer such as Mr. Trump under Saturnian scrutiny by legal authorities for such financial involvements with mobsters, foreign and domestic! And it has--money laundering through real estate seems to have been a favored activity, one that honest Saturn frowns upon. Yet having natal Saturn in the 11th house of Groups and Associations, shows that Mr. Trump could have developed a sense of responsibility by which everyone involved would benefit, for his ties to older, more mature persons have aided him--or negatively have made it easy for him not to evolve. 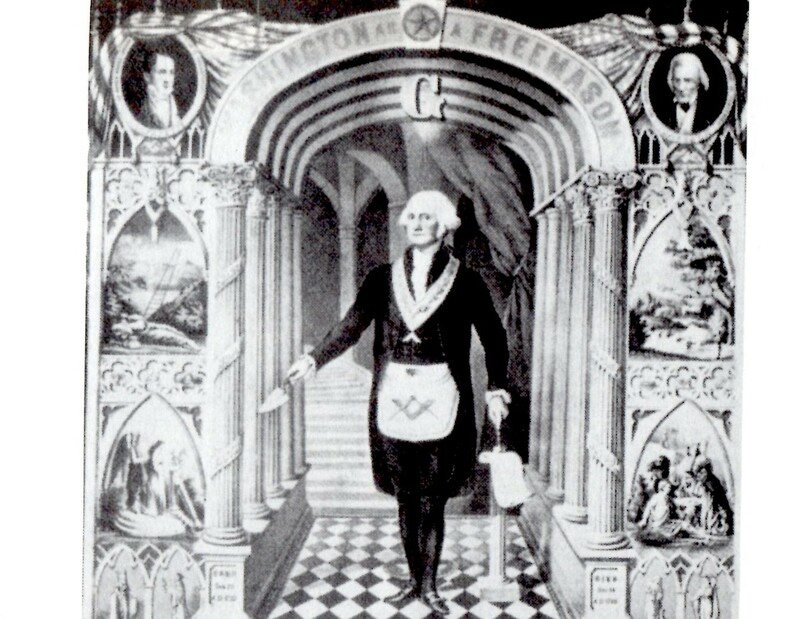 One possibility is that his 11th house potential has been used primarily for membership in an older (ancient?) secret society or club with its own agenda so is this what Trump's take-over of the Republican Party, part of an ongoing, long-planned coup d'etat of our nation, has been about? Remember that Donald Trump is a Geminian thespian who could be smarter and more aware than he plays on TV! So just as with any planetary return, Saturn reinforces the aspects he was engaged in at birth so for Donald Trump we see that any Saturn Return stimulates two aspects: his natal Venus-Saturn conjunction (1S55) indicating loyalty issues, using others for his own emotional gratification, but with possibly a heightened sense of justice, fair play, and the benefits of 'mutual advantage'. 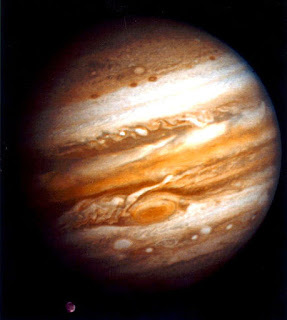 However, feelings of discontent in relationships may affect him off-and-on via Venus-Saturn yet the pair does provide him with a practical approach to problem solving (if only he could clearly see problems through the lens of his confused Mercury-Neptune square of fantasy, falsehood, misconception, distorted impressions, and indiscretion). Simultaneously, a Saturn Return activates a second natal aspect--a difficult Moon-Saturn inconjunct (2A36) where we see his basic childhood complexes thanks to Mom (Moon) and Dad (Saturn). This aspect tends toward emotional immaturity, pessimism, and a fear of betrayal. A suspicious nature is indicated (Dad: "never trust anyone") engendering a cautious, defensive posture which may express emotions at the wrong time or in the wrong way and place (plus, his natal Moon-SN conjunction = bad timing, as noted). A sober facade is often employed in order to hide deep feelings of inferiority and melancholy even while he blurts out show-stopping rhetoric and slogans. Obviously things were off-kilter with Mom and Dad back in the day so that issues of abandonment are in evidence here, plus, a fear of losing emotional control may haunt him even as he rages in fury in a sad attempt to re-exert a measure of control over others while manipulating circumstances to his liking. The May 2005 Saturn Return shown above, as does his first Saturn Return in 1975, has Scorpio rising and Mars-ruled Scorpio tends to control and manipulate others even though a deep need to learn to practice self-control is the real problem. So can cussing loudly and insulting others like a vicious adolescent help matters? Perhaps they did during his childhood and teen years. But unfortunately, We the People are stuck with his rage and inferiority issues because none of these Moon-Saturn tendencies improve with age especially for a non-reflective control freak. Yet if desired, serious Saturn will teach such control and discipline that can result in emotional maturity and a genuine sense of responsibility as long as authoritative Saturn's lessons are faithfully completed first! So there is the timing factor involved in Saturn Returns when reflecting upon serious matters and our part in them, regretful or not, is at hand and a change of course is necessary in order to progress as an adult traveling on the path of the hero's journey. Naturally, Saturn's transits through his Return chart as well as the transits of other planets, provide additional information and timing of events and peaks of various sorts (including the possibility of karmic loss or well-earned rewards). As I type, today's position of Saturn @2Cap32 (his Direct Station degree of September 6th) falls into Mr. Trump's natal 5th house (although the sign Capricorn is intercepted in his 5th house--karmic conditions concerning children and risk-taking to deal with?) and, as noted above, is in the 9th house of Higher Learning, Philosophy, and Distant Travel in the 2005 Return chart. A watershed moment for taking responsibility and paying the Saturnian piper (see lower left, Sun Gem-Moon Sag's image) is coming when transit Saturn opposes his natal Saturn one time on January 21, 2020 (owning up to past mistakes) but karmicly the Great Conjunction of Saturn and Pluto, so recently perfected on January 12, 2020 @22Cap46, is even heavier for it conjoins the natal Vertex of fated encounters in the natal chart of Donald J. Trump where a simultaneous transit of Pluto opposing natal Saturn adds the potential for difficult if not harsh circumstances of the underworld kind. 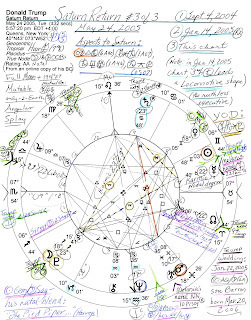 As you see, the Trump Wedding (January 22, 2005) and two stand-out links to Melania's natal chart are highlighted in pink around the Return chart; in light red are the Return's Syzygy Moon (Full Moon @2Sag47 in 1st house); also in light red is its 6th house Prenatal Solar Eclipse ('PE') @19Ari05 in the 7 North Saros Series--theme: sudden passions, lust, birth (Brady). This eclipse could suggest their son Barron yet a Moon-Pluto conjunction may also indicate a child born out of wedlock. That Moon-Pluto conjoins Trump's natal Moon-South Node conjunction (bad timing) makes such a birth more likely but not a definite. Yet along the same lines, Pluto @23Sag41 Rx is apex planet of a YOD pattern with the Mercury-Saturn sextile at its base; this adds to the karmic feel of the Return chart (as in, reaping what's been sown) and times a crossroads situation, a destined change, and/or a spiritual opportunity for karmic progress upon the path of life. A turning point is reached and a new direction is available via apex Pluto but with Mercury-Saturn tendencies toward undermining existing authority, striving to assume a higher level of power, and the ability to usher in a revolutionary new order. Plus, the YOD trio forms a midpoint picture of Mercury-Saturn = Pluto with potentials for: grappling with unusual problems; brooding over one's destiny (to play POTUS? ); plans determine destiny (Ebertin); contemplating loss; fearing wipe-out; feeling a lack of resources; abandonment (Tyl). Could this describe a 'marry me or else I scram' threat? Then checking the natal chart of Melania Knauss Trump born April 26, 1970 at an unknown hour ('noon') in Novo Mesto, Slovenia (follow for a link to her husband's natal horoscope), we see that Trump's Saturn Return #3 of 3 shown above was approximately an annual Mercury Return for Melania (22Tau18/40) while Return Uranus @10Pis35 conjoined her natal North Node (10:09). Was Donald taking responsibility by marrying Melania? One could think so. Their Uranus-NN pairing suggests an unusual and/or exciting connection, one that has been recently 'visited' by transit Neptune in Pisces which hints at undermining conditions affecting their union including deception, and/or a possible 'retirement' of a partner from a 'joint enterprise' (Ebertin). Also, the Return's Sun-Moon midpoint (marriage; husband and wife) conjoins Return Uranus (shared upsets, conflicts, events; inner rebellion; separation) and links to Melania's NN (an association for the purpose of marriage--as it was). And of course, Trump's natal 10th house Uranus in changeable Gemini is his guiding planet or inner voice advising his chaotic style of leadership. Now let's close with another point of interest: the Sabian Symbol for Melania's Mercury: '23Taurus': "A Jewelry Shop Filled With Valuable Gems" which would have been quite persuasive, one imagines. And her Mercury, planet of children, is only one degree from Donald Trump's natal Midheaven (conjunct raging Algol) but is in his 9th house (of Foreigners) so being hyper-subjective and emotionally over-sensitive, the image and appearance of a beautifully 'decorated wife' was naturally important to him as "A CERTIFICATION OF PERSONAL WORTH" (Rudhyar). And I must surmise that apparently Melania Knauss Trump was on the same jewel-encrusted page. You write of a watershed moment on Jan 21st 2020. This would be the day after Trump's second inauguration if he stands and wins again. I've seen another astrologer who looked at the Inauguration Day rather than the November election day to forecast the outcome of the vote for Presidential electoral college. A lot more can happen before we get there though, can't it?